#Hijabs and #French harpies – Yvonne quotes @AjmalMasroor !!!! So the big question posed this week came from travelling imam, public speaker and old friend Ajmal Masroor who declared France a country of Islamophobes, Muslim haters and bigots! In a Facebook posting here: https://www.facebook.com/ajmal.masroor.7?ref=br_rs he exposed French hypocrisy over the reaction by leading politicians towards French student union leader Maryam Pougetoux. Her crime? Well according to French Equality Minister Marlene Schiappa the student was using her headscarf for political gain while being interviewed wearing the piece of cloth on her head. I’ve always said the French are barking mad – an over generalisation, I know, but when you get bigots like Schiappa uttering complete garbage it’s almost a vindication. The French Equality Minister Marlene Schiappa said wearing the hijab was a “form of promotion of political Islam”, adding that the students’ union Unef “should tell us what values it wants to promote, clearly and coherently”. I will defend any Muslim woman the right to wear what she wants as I would any woman on the planet. So the question I would ask is what sort of equality does the minister actually represent? Interior Minister Gérard Collomb also waded in claiming Pougetoux’s appearance in a hijab was a “provocation” that he found “shocking”. Not half as shocking, I would say, as the sheer brutality, torture and violence meted out to the North African communities living under French rule for decades. The French enslaved them, brutalised generations and mercilessly butchered millions, as Masroor rightly pointed out. It’s high time the French confronted their own colonial past and started to own and admit their bad behaviour towards the Muslims who are among today’s French citizens. 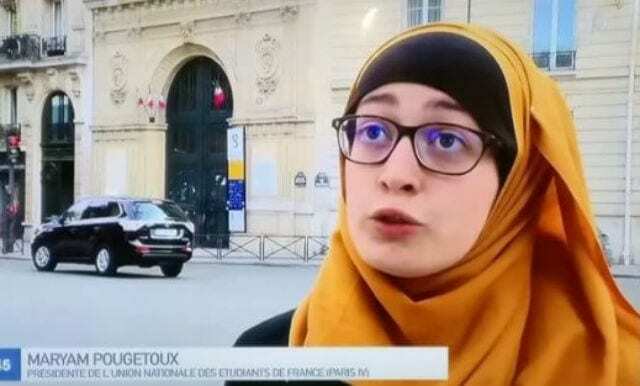 Perhaps the hijab is a constant reminder of their history and exploitation of North Africans including the 200 Algerians thrown off Neuilly Bridge in Paris in October 1961.